After 11 years of existence, the cloud industry would have you believe it is a mature, stable industry that is safe and secure to take your business to. Yet, the secret the insiders in the know is caveat emptor: Let the buyer beware. This presentation covers the state of the cloud today, lessons learned from the early adopters, the new role of cloud keeper, and what to know in advance to create a successful cloud deployment. It ends with a checklist you can use ensure you choose a cloud provider that can meet your needs. Monster VMs Doing IT Right VIRT8209 was a top 10 presentation at VMworld 2016 (Both on Tuesday & Thursday). For a numbers of ?years when I present at VMworld I have made top 10. Its great to have an audience that appreciates the fact I am trying to make it fun and at the same time share a lot of great technical information on vSphere virtualization. This year I asked David Klee, Heraflux? @kleegeek?to join me. David was a tremendous asset to the presentation and a real pleasure to work with. Joining me is this presentation is a lot of work and I really appreciate Davids help and more importantly helping to make sure Monster VMs Doing IT right continues the winning streak of being a VMworld Top 10 Presentation. Given the quality and caliber of speakers at VMworld 2016 this is not an easy feat. 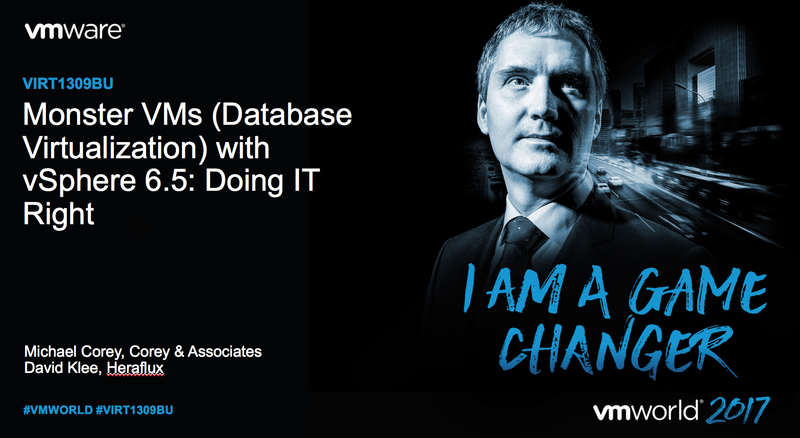 Both David and I are looking forward to taking this presentation to VMworld 2016 in Barcelona. Both these books complement each other and are a very useful to have on hand as you go through the slide deck for Monster VMs Doing IT Right VIRT8290R. Please take the time to subscribe to my Blog. ?You will receive notifications whenever I post a new blog article. This presentation was first given at the Data Summit in New York City. It was a very successful presentation. It was written up on the Forbes website in an article?21 Questions To Ask Your Cloud Computing Provider, Before You Sign?by Joe McKendrick. The most recent version of this presentation was done for the Tech Summit in Washington DC and Boston MA. For an industry that is 10 years old, even in 2016?AWS, Microsoft Azure, Google, and Verizon Cloud still have outages that have taken down companies such as Netflix, Amazon, and Reddit and temporarily put them out of business. These outages and other issues have forced these early adopters to the cloud to rethink their cloud strategies. What is even more disturbing Amazon Web Services tells companies that they should move everything to the cloud, and yet The Wall Street Journal disclosed that Amazon does not follow its own advice of being 100% cloud. This session discusses recent cloud trends, the lessons learned from these events, and what it means to you as a buyer moving forward as you migrate to the cloud. The end of a deck is a Checklist for Choosing a Cloud Provider. ?To keep getting notified when a new version of the deck is available please subscribe to my blog. ?You can subscribe by putting you email in the Subscribe Box on the right hand side of the website. It could happen at any moment. Your database administrator (DBA) ? possibly the only person who knows what?s going on in your database environment ? disappears. Whether it is because of an accident, an illness, a resignation, or a termination; whether it is short term or for good ? your business is in trouble without a DBA at the helm of your database environment. If your database goes down, the applications your organization uses to conduct business can grind to a halt. Given the risk to your business, it is prudent to have a plan in place ahead of time to deal with the unexpected loss of a DBA. Download Ntirety?s eBook for the steps to follow when your DBA exits your company. The Vanishing Database Administrator: Survey of Data Professionals? Career Aspirations, was produced by Unisphere Research and sponsored by Ntirety.Unisphere Research is the market research unit of Unisphere Media, a division of Information Today, Inc., publishers of Database Trends and Applications magazine and the 5 Minute Briefing newsletters. This presentation was given at SQL Saturday Austin #461. The presentation is based upon a top 10 presentation ?Virtualizing Databases: Doing IT Right given? at VMworld last year in Barcelona and the US. In this presentation we will teach you how to properly virtualize any business critical application with specifics on databases and VMware newest release vSphere 6.0. A database is a very resource intensive by its very nature a monster VM and one of the most resource intensive applications you will ever virtualize. If it is not done correctly you will not be successful. This presentation will teach you how to do it right. We will discuss why you virtualize a database, using the right hypervisor, installation, Architecting for performance, the storage layer, the processor, Memory considerations, the network layer. Topics include NUMA, Memory reservations, Network details to how to avoid common mistakes. Special Thanks to Jeff Szastak, Don Sullivan, David Klee and Kanan Mani who helped in the creation of this presentation. Virtualizing Database Doing IT Right – The SeQueL? was given at both VMworld Europe and VMworld USA. It was a top 10 presentation at VMworld. This was a collaboration of? Michael Corey, President of Ntirety and Jeff Szastak, VMware, Inc.
A SQL Server database is a resource intensive application, and thus requires attention to its implementation on a vSphere platform. Attend this technical session to learn how to properly virtualize SQL Server on a vSphere platform. This presentation is the joint work of Michael Corey of Ntirety and Jeff Szastak of VMware. This white paper examines the top 10 most puzzling performance problems and tools for DBAs to spot and correct problems before they happen.